Oak and Teak Epoxy Glue is the newest generation of products from Smith & Co., embodying our new Dual Synergistic Catalyst™, a breakthrough in the control of epoxy resin curing. This new technology not only gives a long working time, but a cure twice as fast as older-technology products. In addition, it will bring about an absolutely dependable full chemical cure at temperatures down to 28°F (-2°C). This is done while maintaining the flexibility and toughness which has been a hallmark of Smith & Co. epoxy adhesives from the beginning. 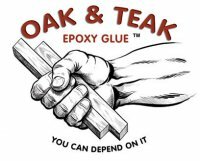 Oak and Teak Epoxy Glue™ will glue all oily hardwoods. It will also (with proper chemical surface preparation) glue a wide variety of metals, glass, rubber and plastic materials. The cured adhesive is completely waterproof and weatherproof. Our expertise in molecular engineering has allowed us to make Oak and Teak Epoxy Glue largely from the natural resins of wood itself. That is why it can dissolve the natural oils of oily hardwoods, and why it bonds all oily hardwoods. Epoxy glues made from petrochemicals cannot do this. Oak and Teak Epoxy Glue is unaffected by the natural acids common to many woods, which is why it bonds oak so readily. This is why it is the All Wood Glue. Oak & Teak Epoxy Glue is the 2004 upgraded version of All Wood Glue, whose technology is based on our Tropical Hardwood Epoxy, a product famous for thirty years of gluing any wood known to man or beast. Oak and Teak Epoxy Glue is intended to be mixed one-to-one by volume, and is forgiving of minor mix ratio errors. Mixing by weight may be done at 10 parts A to 12 parts B by weight. The pot life [working time] is three hours at 50°F, ninety minutes at 68° F, and 45 minutes at 86°F. The corresponding times to reach full cure are 60 hours at 50°F, 30 hours at 68°F and 15 hours at 86°F. The underlying principle is that chemical reaction rates double about every 18 Fahrenheit degrees. Wood that has been saw-cut, run-thru-a-planer, routed or otherwise cut or shaped with high-speed cutting tools can potentially have a film of Mill Glaze. This is a thin film of varnish, made from the natural oil in the wood, that is polymerized (made from liquid oil into a solid) by the heat of the cutting-tool. When the tool is new and perfectly sharp, negligible heat is generated in its use, no oil gets "cooked " into varnish and there is no residual varnish-film on the surface of the wood. When the cutting­ tool gets slightly dull, some heat is developed; as the tool wears more­ and-more, a heavier film of varnish is left on the cut wood surface. If thick, it may be brown or black; if thin, it can be invisible. A glue joint will easily fail, if Mill-Glazed surfaces are glued together. The reason is that varnish is physically weak, and the best glue in the world will stick to the varnish which isn't-at-all well-stuck-to-the-wood. A chain is only as strong as its weakest link, after all. Sand all surfaces before gluing. The sanding does not need to be with something really coarse, such as 100 grit. 220 may very well be adequate; the idea is to ensure a clean wood surface is present before beginning the gluing process. After sanding, clean off the sanding debris with compressed-air or a tack-rag. Don't use paper towels wetted with solvent, as the solvent will be absorbed into the wood and weaken the glue-joint. For best results mix in one container, transfer to a second container and mix again. Allow to sit 10 to 20 minutes before use, and allow to sit on wood joints with exposed end grain or exceptional roughness for at least ten minutes before assembly. Soft rubber pads under clamp faces will maintain an even pressure on the joint as excess glue is squeezed out. High clamping pressure will crush wood fibers directly under the clamps, leading to glue-starved joints in those spots, as well as wood-under-stress, and glued assemblies of highly stressed wood will readily fail. The reason for that is that the shear strength of wood [cleavage or splitting] parallel to the grain is very low. Gentle clamping, steam-bent or thin wood laminations and cross-grain fasteners or tenons, all these contribute to a long-lasting glued wood structure. Mill glaze is veryhard to detect when the tool is almost sharp and the varnish is very thin, but it can destroy glue-joint integrety nonetheless. Our Epoxy Clean Up Solvent Epoxy Cleanup Solvent will dissolve and clean up excess Oak and Teak Epoxy Glue before it has gelled. Once cured, there is no cleanup solvent. [View Cart] Email this page to a friend.